Once again, it seems that yesterday's conspiracy theory is today's news. However, the signposts have been there all along. Microchip implants to track pets and livestock and the elderly are now widely available, while microchipping kids is not far off. Extensive animal testing has been conducted on monkeys to enable them to control devices via brain-computer interface. Edible "smart pill" microchips have been embraced as a way to correctly monitor patient dosages and vital signs. 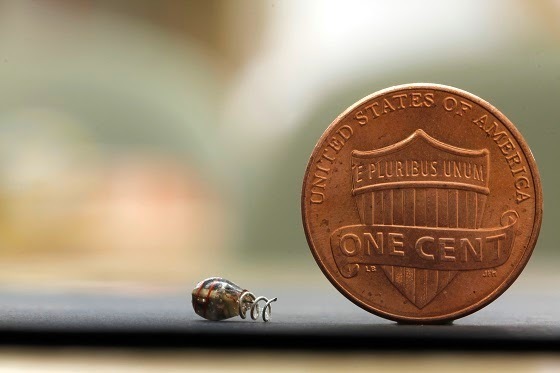 In the name of health and security - always the dynamic duo for introducing the next level of science fiction into everyday reality - a new wirelessly powered implant a fraction the size of a penny, as seen above, promises to offer a whole new ease of medical monitoring and drug delivery.